Gelam honey makes the cancer cells commit suicide! What are Gelam Honey’s (aka Melaleuca or Cajeput honey) benefits for our health? How is this that cancer cells commit suicide? What’s in honey that is so bad to them? Lately, there have been lots of studies on its benefits, but probably the most important activity of honey that was researched was its antiproliferative and apoptosis induction. Meaning if it heals cancer or not, because this is our most acute concern these days! Induces apoptosis in cancer cells. Necrosis and Apoptosis are the two ways our cells are dying. – doesn’t get blood – like in a case of heart attack, stroke or death. When a cell dies through necrosis, this causes an inflammation, which can trigger further distress or injury within the body. Apoptosis is suicide. Also known as programmed cell death, a controlled, predictable process. Here is how it’s done: the cell that has been stressed, damaged or triggered by body signals to kill itself, begins to shrink and form blebs. Proteins (called caspases) start to break down the cell’s components. Enzymes break down the nucleus and signals are sent to the macrophages (a special kind of cells, like vacuum cleaners). The cell eventually breaks into smaller parts and the already called macrophages clean up the mess. When does a cell know it should suicide itself? 1. When cells recognize viruses and gene mutations, they commit suicide to prevent the spreading. 2. When cells are under stress, as may happen when free radicals are on the loose or when a person undergoes radiation. – a decrease of apoptosis is met in lupus or cancer. Our scientists are researching on how to control the signals that tell a cell to continue to live or to die. Today’s radiation or anticancer drugs are supposed to trigger apoptosis only in the diseased cells. The bad thing is that this never happens. Healthy cells are killed together with the sick ones. But guess what! This does happen with honey. 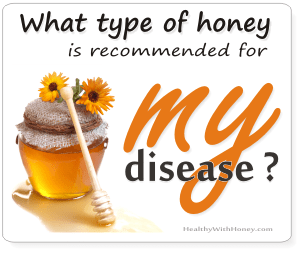 Honey is a natural treatment for cancer. After a person takes honey, his sick cells kill themselves. And this is what hundreds of studies are showing: in vivo, in vitro, on animals or in human clinical trials. Products of the hive do have a clear benefit on the human body. What happens in a cancer cell? A normal state in our body is maintained by a balance between apoptosis and cell renewal (the birth of new ones). A cancer cell is continuously dividing, causing cellular and organ dysfunction. Among the population of Asia, liver cancer has a high frequency rate, closely linked to chronic hepatitis B infection. The drugs have failed, and a resistance to them have been found, and side-effects are devastating. For this reason, most of the studies made on how honey can prevent cancer or how to treat the existent one, are conducted in Asia. The University of Malaysia has published lots of studies, made on different types of honey, especially on Tualang honey, Gelam honey, Manuka honey. – powerful antioxidant compounds which lead to free radical scavenging. 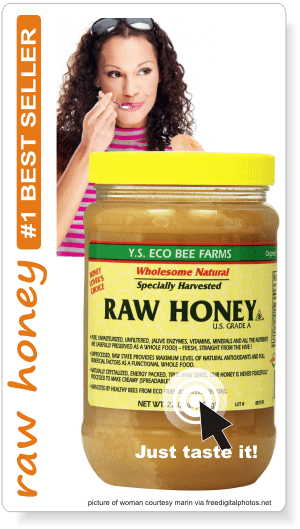 From all the superfoods, why was honey chosen for the studies? First, the food must have a high content of antioxidants. They are known to prevent different diseases, such as cancer, coronary diseases, inflammatory disorders, neurological degeneration, and aging. Honey is rich in phenolic compounds and other antioxidants like ascorbic acid, amino acids, and proteins. Some phenols and polyphenols found in honey proved to be promising pharmacological agents in the treatment of cancer. caffeic acid (CA), caffeic acid phenyl esters (CAPE), Chrysin (CR), Galangin (GA), Quercetin (QU), Kaempferol (KP), Acacetin (AC), Pinocembrin (PC), Pinobanksin (PB), and Apigenin (AP). The study “Phenolic acid composition and antioxidant properties of Malaysian honeys.” studied the phenolic acid and flavonoid contents of Malaysian tropical honeys: Tualang, Gelam, and Manuka honey. Among the Malaysian honey samples, Tualang honey had the highest contents of phenolics, flavonoids and DPPH radical-scavenging activities. · 5 flavonoids: catechin, kaempferol, naringenin, luteolin, and apigenin. The conclusion: Tualang honey is the richest in phenolic acids, and flavonoid compounds, which have strong free radical-scavenging activities. • The study “Antiproliferative Activity and Apoptosis Induction by HGelam honey on Liver Cancer Cell Line” by Zakiah Jubri et al., from the National University of Malaysia, and published by the International Journal of Applied Science and Technology, on April 201, was researching the antiproliferative effects of gelam honey on liver cancer, HepG2. This honey has high polyphenols content that possesses antioxidant and free radical scavenging activity towards preventing cancer and diseases. Gelam honey reduced the proliferation of HepG2 at concentrations of 3% to 70%. Morphological analysis for apoptosis detection using fluorescent microscope under 400X magnification producing typical apoptotic characteristic. It showed that gelam honey has antiproliferative activity towards cancer cell by its ability to induce apoptosis. but not affecting the normal liver cells. • Gelam honey attenuated radiation-induced cell death in human diploid fibroblasts by promoting cell cycle progression and inhibiting apoptosis., by Tengku Ahbrizal Farizal Tengku Ahmad et al. from the Universiti Kebangsaan Malaysia. The aim of this study was to elucidate the role of Gelam honey as a radioprotector in human diploid fibroblast (HDFs) which were exposed to gamma-rays by determining the expression of genes and proteins involved in cell cycle regulation and cell death. The conclusion: Gelam honey acts a radioprotector against gamma-irradiation by attenuating radiation-induced cell death. • The antioxidant effect of the Malaysian Gelam honeyon pancreatic hamster cells cultured under hyperglycemicconditions, by Kalaivani Batumalaie et al., published on March 2013. Type 2 diabetes consists of progressive hyper-glycemia, insulin resistance, and pancreatic ß-cell failure, which could result from glucose toxicity, inﬂammatory cytokines, and oxidative stress. THe authors of the study investigated the effect of pretreatment with Gelam honey (Melaleuca spp.) and the individual ﬂavonoid components chrysin, luteolin, and quercetin, on the production of reactive oxygen species (ROS), cell viability, lipid perox-idation, and insulin content in hamster pancreatic cells (HIT-T15 cells), cultured under normal and hyperglycemic conditions. The results: “Data showed that pretreatment with the extract of the Gelam honey and the different favonoid components at the indicated concentration, for 24 h at 37°C, protects ß-cell function from the oxidative damage caused by the ROS, under hyperglycemic state. • Effects of Gelam and Acacia honey acute administration on some biochemical parameters of Sprague Dawley rats, by Samat S et al., observed the effects of acute administration (14 days) of Gelam honey, a wild harvesting honey and Acacia honey, a beekeeping honey, on male and female Sprague Dawley (SD) rats (a type of rats used in laboratory). The results suggest that acute consumption of Gelam Honey and Acacia Honey at 2000 mg/kg body weight of male and female Sprague Dawley rats has some discrepancy effects on biochemical parameters but in line with OECD regulation. Gelam honey may have potential in controlling weight gain and triglyceride levels in female rats compared to Acacia honey. What is melaleuca honey? 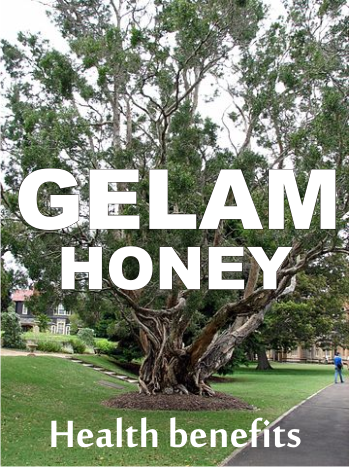 Or gelam honey? Why so many different names? Is manuka honey a natural treatment for MRSA? Is it the best? melaleuca how compares to manuka in regards its anti cancer properties ? 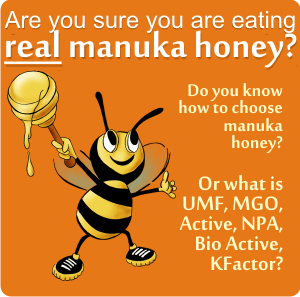 There are not that many studies on manuka honey’s anticancer properties. More on its antibacterial properties. On this regard, there are some comparisons with other honeys and the conclusions say there are some bacteria strings that respond better to manuka and some that respond better to other honeys. It’s a difficult research, because opposed to synthetic drug, which are always the same, honey is never the same. It depends on geographic area, weather and time of harvest and time of consumption (they change in time) so even if a certain batch proved to be effective on a certain bacterium, this doesn’t guarantee the effect will be the same for all other batches. Essential oils are more stable in this regard. 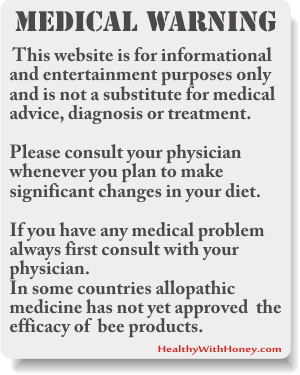 But as I said before, in all conditions, honey (all raw honey) is preventative more than curative. General comparisons cannot be done between manuka and all the other honeys for all microbes. It’s easier to search starting from a certain bacterium that you know and then search to see what type of honey can kill it more efficiently. melaleuca how compares to manuka in regards its antibacterial properties ? How much gelam honey would you need to take per day for it to work? The doses used in this study, were of 2000 mg honey/kg body weight. Per day. So, 2g/kg bw. 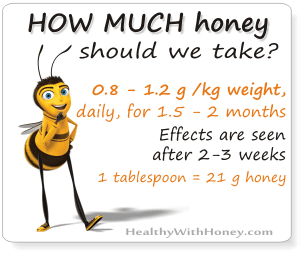 A tablespoon has 21 g honey. If you have 60 kg, you need 120 g of honey, almost 6 tablespoons per day. Really good job. Thank you very much for your post:-). Best regards! How can I obtain Gelam honey? I am British but live in France. Where to buy Gelam Honey, Please? 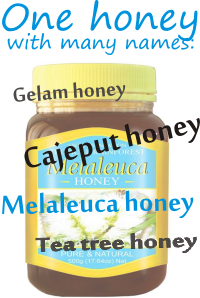 Unfortunately I don’t know a trustful source of gelam (melaleuca) honey. From what I’ve seen on the online, there are some shops selling it like here, or here, but I don’t know if they sell worldwide, or if they are trustful. Or here. My advice is to ask for details, send emails, check Facebook – some local beekeepers use this cheap form of advertising to sell their products. And gelam/melaleuca honey surely is worth all this trouble. I hope some day we will be able to find it on more reliable and popular online shops.